Crosslinking-aided gelation was utilized to prepare hydrogels from softwood polysaccharides, with spruce galactoglucomannans (GGM)—a group of largely unexploited hemicelluloses—as the main component, aiming at conversion into sponge-like aerogels. 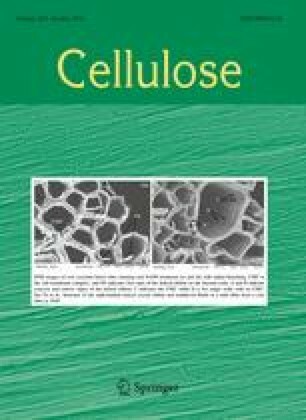 Cellulose nanofibrils were used for the formation of a reinforcing network, which was further crosslinked together with a GGM matrix by ammonium zirconium carbonate, an inorganic salt that is regarded as safe for use in food packaging. The hydrogels were freeze-dried into stiff, low-density aerogels with 98 % of their volume composed of air-filled pores. When immersed in water, the aerogels absorbed water up to 37 times their initial weight, demonstrating elasticity and repeatable and reversible sponge capacity. The developed concept reassembles the wood polysaccharides in a new way, creating interesting possibilities for utilizing the abundant “green gold,” GGM. The obtained biobased materials could find application potential, for example, in the field of food packaging and could contribute in the reduction of the usage of petroleum-based plastics in the future. The online version of this article (doi: 10.1007/s10570-016-1010-2) contains supplementary material, which is available to authorized users. The Department of Food and Environmental Sciences, University of Helsinki, Finland and the Academy of Finland (SA and KP: AEROWOOD project number 281628; KSM: MESTA Project Number 268144) are gratefully acknowledged for financial support. M.T.C. gratefully acknowledges financial support from the Junta de Comunidades de Castilla-La Mancha (JCCM) under Project PPII-2014-025-P. NordForsk via PolyRefNorth network is thanked for funding SA’s research visit to Innventia, Stockholm, Sweden, and COST Action FP1105 for PAP’s visit to the Laboratory of Nanotechnology, University of Castilla-La Mancha, Almadén, Spain. We thank Prof. Lars Berglund and Assoc. Prof. Qi Zhou (WWSC, KTH, Stockholm, Sweden) for the CNF, Anne-Mari Olsson (Innventia) for helping with the DMA-analysis, M.Sc. Ângelo Lusuardi (University of Castilla-La Mancha) for helping with the AFM/UFM measurements, Abdul Ghafar (University of Helsinki, Finland) for helping with the optical microscope images, and Prof. Maija Tenkanen and Prof. Ritva Serimaa (University of Helsinki, Finland) for fruitful discussions and constructive suggestions.